Found her on the 1900 Council Grove, Morris, Kansas census (dist 191 img 7) as Laura E. Raymond age 45. Has given birth to 7 children, 7 are living. Found her on the 1880 New York (Manhattan), New York City-Greater, New York census (dist 662 img 1) as Katie Horton age 28. Father, mother born Baden [Germany]. Found her on the 1900 Stamford, Fairfield, Connecticut census (dist 104 img 13) as Katie Horton age 45. Found her on the 1910 New Canaan, Fairfield, Connecticut census (dist 87 img 6) as Catherine Horton age 58. Found him on the 1920 New Canaan, Fairfield, Connecticut census (dist 131 img 1) as Cathernie Horton age 67. Found her on the 1930 Milford, New Haven, Connecticut census (dist 173 img 35) as Catherine Horton age 77, widow, living with her daughter Jessie and her husband DeWitt Merritt. Found her on the 1900 Murray, Orleans, New York census (dist 105 img 4) as Lucy A. Beck age 10. Found her on the 1905 Murray, Orleans, New York state census as Lucy A. Beck age 15. Found her on the 1910 Murray, Orleans, New York census (dist 157 img 18) as Lucy Beck age 20, servant, private family. She is in the household of William and Harriette Frost. Found her on the 1920 Albion, Orleans, New York census (dist 159 img 17) as Lucy Finger age 30. Found her on the 1930 Murray, Orleans, New York census (dist 20 img 12) as Lucy Finger age 40. On Saturday, June 29, a candlelight wedding took place in the First Presbyteriari Church of Holley, where Pamela Jean Cady and Scott William Hamel were united in matrimony. The Reverend Paul Attamer officiated at the 5 o'clock double ring ceremony with Reverend Gary Pindar assisting at his cousin's wedding. Soloist Mrs. Kenneth Spychalski sang "One Hand. One Heart". Mr. and Mrs Everett Cady of Holley and Mr. and Mrs. William C. Hamel of Fairport are the parents of the newlyweds. The bride selected a princess styled gown of white silk organza and peau d'ange lace, designed with a shallow lace-edged scooped neckline, long, straight, tapered sleeves and a detachable chapel length train. Peau d'ange lace appliques and seed pearls enhanced the bodice, skirt and train. A lace-covered Camelot cap, trimmed with seed pearls, held her bouffant cathedral length illusion veil and she carried a cascade bouquet of white carnations, stephanotis with a touch of blue baby's breath. As a symbol of unity, during the ceremony, the bridal couple each held a single candle and lit one candle together. They also presented each mother a single long stemmed red rose, as the soloist sang "The Lord's Prayer. Mrs. Lewis Passarell Jr., sister of the bride, was matron of honor and chose a gown of pink floral dotted swiss. Bridesmaids Lynette Cady, sister of the bride, Linda Spada and Mrs. Sharon Mandriacchia of Holley, and Kathleen Leary of' Gates, all friends of the bride, wore gowns identical to the matron of honor, in blue. Flower girl, Amy Passarell, was dressed like the maid of honor. The attendants all carried baskets of matching daisies. Bernard Keating served as best man. Ushering were Daryl and Evan Cady, brothers of the bride, also, Ralph Williams, Gary Korn and Richard Heckert. Daniel Wiemer was ring-bearer. The newlyweds received their guests at a reception at the Craig Hill Country Club, arid later departed for a honeymoon to the Bahamas. Found her on the 1920 Justice Precinct 1, Collingsworth, Texas census (dist 30 img 11) as Leola M. Crone age 11. Found her on the 1920 Potter, Yates, New York census (dist 184 img 15) as Ruth Dorman age 5. Found him on the 1920 Grover, Marinette, Wisconsin census (dist 135 img 6) as Ervin Finger age 5. Found him on the 1930 Grover, Marinette, Wisconsin census (dist 9 img 15) as Erwin Finger age 15. Found him on the 1880 St. James, Phelps, Missouri census (dist 123 img 4) as James W. Finger age 2. Found him on the 1900 St. James, Phelps, Missouri census (dist 101 img 1) as James W. Finger age 22, single, living at home. Farm hand. Found him on the 1920 Central, Franklin, Missouri census (dist 60 img 9) as James Finger age 40, farmer. Found her on the 1880 Livingston, Columbia, New York census (dist 23 img 18) as Maggie Fingar age 15. Found her on the 1900 Livingston, Columbia, New York census (dist 25 img 33) as Maggie Lynk age 36. Has given birth to 5 children, 5 are living. Found her on the 1930 Livingston, Columbia, New York census (dist 38 img 13) as Maggie Lynk age 65. Found him on the 1850 Lincoln County, North Carolina census (img 28) age 9. Found him on the 1860 Lincoln County, North Carolina census (img 11) as Robert P. Finger age 19. Private, Company I, 11th Regiment, NC Troops - Resided in Lincoln County where he enlisted at age 20, March 11, 1862, for the war. Present or accounted for until killed at Gettysburg, Pennsylvania, July 3, 1863. Family 1 : Joan E.
Found him on the 1920 Jerusalem, Yates, New York census (dist 177, img 1) as Roger Finger, age 6. Found her on the 1900 Justice Precinct 2, Hall, Texas census (dist 9 img 3) as Susie V. Finger age 10. 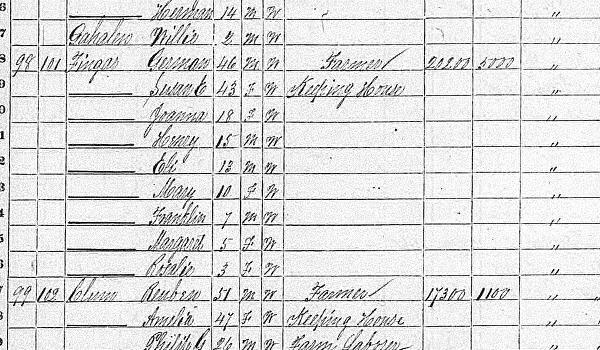 Found her on the 1900 Maple Creek, Outagamie, Wisconsin census (dist 91 img 8) as Viola Finger age 4. Found him on the 1940 Other Places, Davidson, Tennessee census (dist 19-22 img 33) as Walter W. Finger age 6. Found her on the 1920 Rabbitville, Clinch, Georgia census (dist 62 img 6) as Willie Mae Finger age 9. Found her on the 1880 (not stated), Tarrant, Texas census (dist 92 img 1) as Susan A. Harrison age 14. Found her on the 1900 Justice Precinct 2, Tarrant, Texas census (dist 110 img 15) as Susie Floyd age 35. Found her on the 1910 Mosley, Murray, Oklahoma census (dist 206 img 5) as Susan A. Floyd age 44. Has given birth to 4 children, 4 are living. Found her on the 1860 Jerusalem, Yates, New York census (img 20) as Clara Carvey age 18. She and her husband Judson are living in the household of her father Walter and Phebe Henderson age 50. Found her on the 1920 Jerusalem, Yates, New York census (dist 177 img 5) as Clara Carvey age 58. Father born Scotland, mother born New York. Found her on the 1930 Jerusalem, Yates, New York census (dist 9 img 16) as Clara Carvey age 68. Found her on the 1870 Metompkin, Accomack, Virginia census (img 57) as Triphany Honey age 1. Found her on the 1900 Coston, Worcester, Maryland census (dist 97 img 11) as Triffa C. Benson age 30, born June 1870. Has given birth to 3 children, 3 are living. Found her on the 1910 Atlantic, Accomack, Virginia census (dist 1 img 5) as Trifa C. Benson age 41. Found her on the 1900 Cicero, Onondaga, New York census (dist 40 img 15) as Ina Littleboy age 14. Found her on the 1910 DeWitt, Onondaga, New York census (dist 47 img 23) as Ina M. Littleboy age 25, single, living at home. Found him on the 1900 Richmond, Ontario, New York census (dist 77 img 22) as William H. McClurg age 36, farmer. Father, mother born Ireland. Also in his household are 4 children and Martha McClurg age 71, widow, his mother. She was born Dec 1828, Ireland. Found him on the 1920 Richmond, Ontario, New York census (dist 99 img 6) as William H. McClurg age 56. Found him on the 1870 Caldwell, Catawba, North Carolina census (img 21) age 18. Found him on the 1900 Clermont, Columbia, New York census (dist 10 img 11) as John R. Tinklepaugh age 6 months. Found him on the 1910 Clermont, Columbia, New York census (dist 9 img 10) as John R. Tinklepaugh age 10. Found him on the 1930 Albany, Albany, New York census (dist 58 img 78) as John R. Tinklepaugh age 30. Distributor, tractors. Found him on the 1910 Brooklyn Ward 9, Kings, New York census (dist 191 img 7) as Albert M. Trenholm age 40, physician, general practice. Found her on the 1880 Ironton, Lincoln, North Carolina census (dist 101 img 6) as Laura Rudisill age 18. She, her husband, and son Jonas are living with her father Solomon. Found her on the 1900 Ironton, Lincoln, North Carolina census (dist 109 img 5) as Laura S. Rudisill age 38. Found her on the 1910 Ironton, Lincoln, North Carolina census (dist 69 img 3) as Laura S. Rudisill age 48. Has given birth to 12 children, 11 are living. Found her on the 1920 Ironton, Lincoln, North Carolina census (dist 104 img 9) as Laura S. Rudisill age 57. Found her on the 1930 Ironton, Lincoln, North Carolina census (dist 9 img 8) as Laura S. Rudisill age 68. Found him on the 1910 Salina, Onondaga, New York census (dist 87 img 36) as Christian Weber age 68, farmer. Found him on the 1930 Salina, Onondaga, New York census (dist 182 img 2) as Christian Webber age 87, widower. He is living with his daughter and son-in-law Gabriel and Martha Schiesser. Found him on the 1910 Buffalo Ward 11, Erie, New York census (dist 103 img 31) as George Weigand age 38. Carver, chair factory. Found him on the 1920 Buffalo Ward 15, Erie, New York census (dist 114 img 35) as George Weigand age 47. Wood worker, shop. There is a George Weigand on the 1930 Buffalo, Erie, New York census (dist 98 img 33) listed as a widow, age 59. He is a roomer in the household of George Filbert age 57. Found her on the 1900 Germantown, Columbia, New York census (dist 13 img 34) as Edith M. Yager age 2.